What is he – a musician, a chemist, an engineer, a cabinetmaker? — Neither. 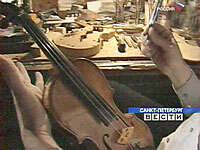 Alexander Rabinovich from St. Petersburg is a master of violin-making, who has unraveled the secret of the great Stradivarius. It seems that in this old intricate apartment of his located in the very center of St. Petersburg, with the smell of lacquer and coffee, with windows facing the Cathedral of Our Lady of Kazan one should speak of only lofty things. Going to Rabinovich’s I was seriously thinking of taking with me a white smock-frock and gloves — the violins are really unique, after all. As for the Master, I imagined him if not as a magician in a high cap, but at least as a venerable grey-haired elder. But he wears jeans and sweater and even has recently shaved his beard off. 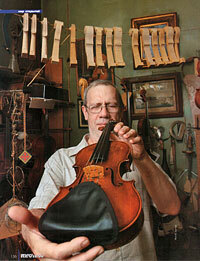 — There is nothing complicated in the violin structure. 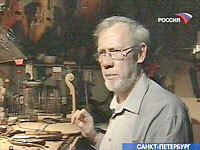 The difficulty is in what makes the instrument sound in a live voice — in the microstructure of the wood processed according to a specific technique. Wood is a set of voids, a set of capillary tubes. My task is to saturate these tubes with a sound-bearing essence — and that is all! And it is not a matter of geometry and even less a matter of beauty. The “Italians” (the customary title of instruments by Italian masters of the XVI-XVIII c.) may be outwardly ugly, asymmetrical but still have a charming, live voice!.. — Any mystic matters are completely alien to me. What exists in reality? – The live voice does. It is this reality which has enabled me to reach a certain result. Some people try to say: look, he prefers to work at night, so... But there is a quite real explanation to this — nothing and nobody disturbs. No fuss, no vanity. He seems not to be kidding and indeed finds an absolutely realistic explanation to what is most wonderful and mysterious. — Talking of the boards. What do I do? 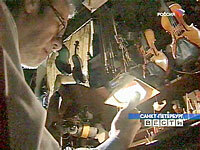 I work on catching a polymer which imbues the capillary tubes, that is makes my instruments live. The polymer results in the process of stratification in the course of specific processing of amber. When you stir melted amber, a kind of hardly-seen “pearlness” appears. And at this moment I have to stop, freeze, catch it. Then the essence will stratify the way I need it… During the daytime, in all that fuss I can do the same but I’m not always able to catch this moment. Musicians state that there is a trouble with instruments by Alexander Rabinovich, a strange thing happens: it is impossible to get accustomed to them; on the opposite, every year new capabilities are found in them. Anyway the Master himself, in spite of his demonstratively realistic perception of the world, with no fake modesty gives a 300-year warranty for his works. Why this exact term? 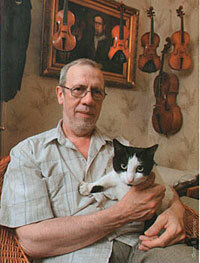 Because the works by Stradivarius are now 300 years old but they have not lost their richness in sound. 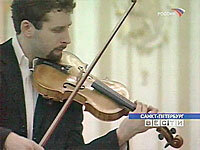 And if the mystery has been unraveled, then why should the violins by Rabinovich live less? — You are once again speaking of mystery. There is no mystery, there is work – and the ability to think given to humans by God and Nature. Yes, I mean to think and not to get inspiredly lost copying the curves and cracks and counting millimeters of the “Italians”. It had been done for three centuries with no result. So the matter is not in geometry. But in what? For instance, let us take wax. Of course waxen wood in really beautiful. But what if we take mineral wax? Or Punic? – OK, eureka, cheeks pouted… But if we shake our head and think what is wax as it is? Odysseus stoppled his ears with it not to hear the Sirens. It is a monomeric amorphous essence, a deadening. And if we stuff the capillary tubes of the wood with wax – what shall we get? I guess you dig it. Now let’s regard the oil lacquers. They copy the old prescriptions, or should I say recipes, where linseed-oil is boiled with salts of different metals to get linseed drying oil. Let’s take any reference book and read: drying oil — the process of drying is endless. And if I saturate wood with drying oil, it will be getting dry for a long time. But when at last it gets dry, the sound will die. The capillary tubes stuffed with drying oil cannot sound. So we should search for something else. And what I say is: it’s simple! Yes, it is surprisingly simple. But to reach this simplicity, half a century had been necessary. 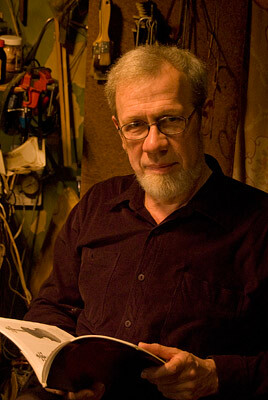 A Leningrad boy Alex Rabinovich was about ten years old when he first heard the live voices of violins in the workshop of Ivan Krivov, the father of his schoolmate. The young Alex was far from music but the obvious riddle why outwardly similar instruments sound differently puzzled him. So he began to learn from Ivan Petrovich Krivov. First he just copied, then would make simple repairs, then came the restoration, but he was always trying to understand why one instrument sings and the other just sounds. To solving this riddle he has come, according to his own words, through mental experiment. — In general it is enough just to think and to read. There is everything in books. I have read that in Italy on the Etna mountainside there was an amber field. This amber was dissolved in volatile oils, this being the first step in technological processing when preparing Italian base coating. In the end of the XVIII c. the field ran out – and simultaneously the “old Italians’” technology was lost. In my opinion, it cannot be just a coincidence. Ready instruments are hanging on a fishing line right over your head. In the small room the smell is specific. Maybe it is the smell of the amber which Rabinovich brings in his own car from the Baltic coast? Or of maple and fir-tree from a German town of Bubenreuth, one of the violin capitals of the world? The workshop at home is not for comfort and not out of laziness. Alexander dreams of creation of a musical instruments’ foundation and a school of masters to house the workshop, the museum-shop, the library with a fireplace where listeners, musicians, their pupils could come. But the Master’s strongest dream is of worthy pupils. — Here is a violin... How many such shapes have I drawn? Thousands. How to teach it? One has to achieve understanding through suffering. Why this line is fine and that one is not? 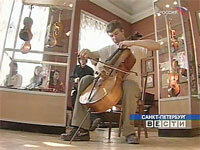 Why in this violin it is ideally correct but lifeless but in another one it is live? The student, no, the disciple should stay with his master for whole days, to think together, read, listen to music, meet people. Anyone can ‘plane’ an instrument. But one must interiorize the image, see what it should be and remove the excess. It is real but not utilitarian. Beautiful but not mannered. Refined, elegant but firm. Understanding of the essence of his work is now very close — just stretch your arm and you’ll get it — and now eludes your grasp. The same may be said of the “Russian Italians” made in his ancient apartment, where the Master looks through the window at the boiling Nevsky and then, in the night silence and peace tries to catch his “pearlness”. — Alexander, what a romantic you are! — Yes, but under a very thick hide of, say, stegosaurus type. I lag behind this life by three hundred years; I stayed there, with Stradivarius.